The adorable and enigmatic axolotl is capable of regenerating many different body parts, including limbs, organs, and even portions of its brain. Scientists hope that a deeper understanding of these extraordinary abilities could help make this kind of tissue regeneration possible for humans. With news today of the first complete axolotl genome, researchers can now finally get down to the business of unravelling these mysteries. Axolotls are tiny aquatic salamanders whose only native habitat is a lake near Mexico City. Many animals, such as frogs, sea stars, and flatworms, are capable of tissue regeneration, but the axolotl is unique in that it can regenerate many different body parts over the course of its entire life cycle, including limbs, tail, heart, lungs, eyes, spinal cord, and up to half of its brain. 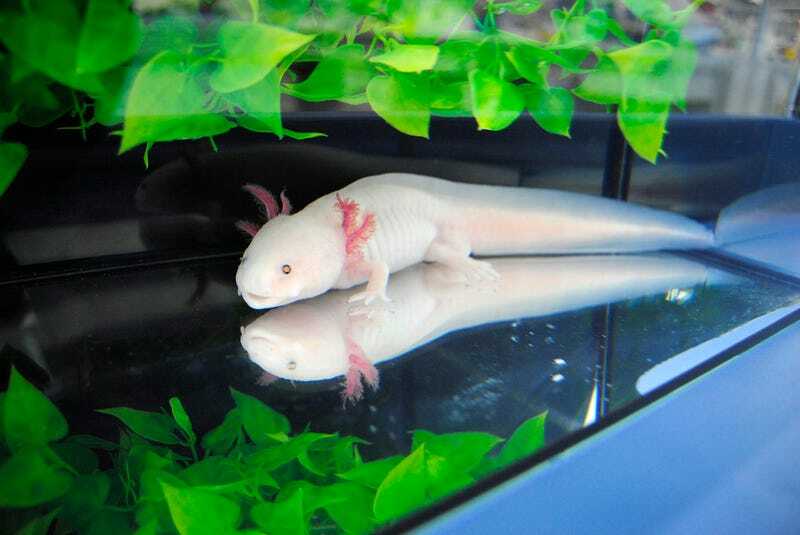 In a scientific first, researchers from the University of Kentucky have assembled the axolotl genome, the details of which were published today in Genome Research. On its own that may not sound so impressive, as many animals have had their genomes sequenced in recent years. But consider the sheer size and complexity of the axolotl genome, which consists of 32 gigabases, or 32 billion base pairs. Indeed, previous work into the axolotl genome has yielded a tremendous amount of genetic data, but the challenge has been in correctly placing each puzzle block in the correct location. A genome must be assembled in the correct order for scientists to truly understand how it works. Genome sequencing and assembly are iterative processes, according to Randal Voss, the co-lead author of the new study and a professor in the University of Kentucky’s Spinal Cord and Brain Injury Research Centre. Last year, his team reached a point where they had a manageable number of pieces to work with, around 125,000 large chunks of DNA, but they still had to organise these pieces into 14 extremely long linear DNA puzzles. To do the genetic linkage analysis, Voss used tissues that were generated and frozen 18 years ago by crossing axolotls to tiger salamanders. It took him three years to perform these crosses. The first generation crosses were made in 1997 and the second generation crosses were made in 2000. Using these crosses, Voss, with study co-lead author Jeramiah Smith, identified genomic regions—in the linkage mapping sense—to explain certain aspects of axolotl growth and development. Other genetic mapping studies continued over the next several years. Now that researchers have a near-complete axolotl genome—the new assembly still requires a bit of fine-tuning (more on that in a bit)—they, along with others, can now go about the work of identifying the genes responsible for axolotl tissue regeneration. By doing so, scientists may eventually be able to regenerate tissue in humans, facilitating limb and skin regrowth, spinal cord repair, and organ healing. This is no idle speculation; the study was funded by the U.S. National Institutes of Health and the U.S. Department of Defense. Murawala is particularly excited by the potential for cardiac-related breakthroughs. During their research, Voss and Smith discovered a mutant axolotl who was unable to repair its heart. This led to the identification of a mutation in its tnnt2 gene. 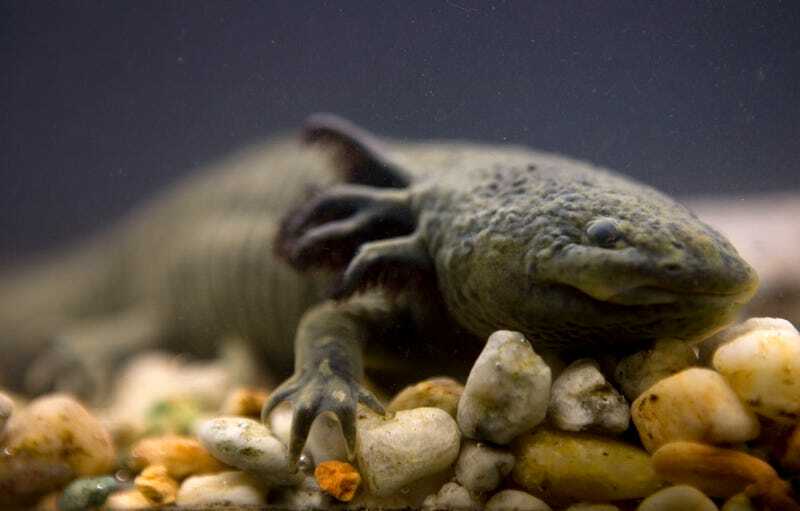 The identification of this gene, along with others required for axolotl generation, will in the future allow scientists to identify “regenerative roadblocks in mammals,” in the words of Murawala. Jessica Whited, an assistant professor at Harvard University’s Department of Stem Cell and Regenerative Biology, described the new work as a “landmark study” that, on its own, is a valuable resource, but also serves as an important proof-of-concept for genetics research into axolotls. As noted, genome sequencing and assembly is an iterative process, so there’s still work to be done. Building a chromosome level assembly for the axolotl is a major accomplishment, no doubt, but Voss and his colleagues are now looking to the next step, which is to make the assembly even better.